This document describes proceedures that can be used to determine problems with the Ford Falcon EF and EL Supplementary Restraint System or otherwise known as the airbag. Basically, an Airbag is kinda like a heavy duty party baloon, that inflates when you have a severe accident. The reasoning behind the Airbag is to induce a party type atmosphere, to help cheer up the Driver, and if optioned, the passenger as well. It also has the curious effect of preventing the Driver, and passenger from head-butting the Steering Wheel, and Crash pad, which can further enhance the Drivers, and Passengers chances of surviving the said accident. Which is a good thing, as to replace the Airbag is very expensive, and the Driver will need every ounce of his or her Health, in order to return to a well paid, and gainful employment, to help pay for his or her new airbag(s). Airbag Operation The Airbag system used in the Australian Ford Falcon, Fairmont, Fairlane, XR, and LTD Models, is designed to work in conjunction with the Seatbelts. Therefore, the Airbags are designed to deploy at forces equivalent to Crashing in to a stationary object, at speeds greater than 25Km/ph. Obviously this is a good thing, due to their great expense to replace them. The Airbag deployment can only be described as Violent. At the moment the Airbag system detects a severe impact, the Nylon Airbag(s) will inflate in around 40-50 milliseconds. The inflated airbag is designed to slow the forward motion of the driver, and the passenger, helping to reduce impact forces to the head and chest. Finally, the inflated Airbag is designed to deflate almost immediately after physical contact. Airbag deployment is determined by 2 Crash sensors and a safing sensor. It must be noted that one crash sensor, and one safing sensor must be triggered, in order for the Airbag to deploy. The Airbag system also contains a Backup Battery, so as to allow deployment, even after the Vehicles battery has been destroyed after a severe frontal impact. Finally, the Airbag can be deployed when the Ignition is either On or Off ! This means that the Airbag can be accidentally deployed, even though the Key is not in the Ignition, and the Battery is disconnected ! It monitors the Airbag system to determine any Faults and system readiness. The Airbag Diagnostic Monitor, complete with an internal Backup power supply. The Ignitor, which is within the airbag. The Dirvers Airbag is mounted on the center Boss, of the Steering wheel. The Passenger side Airbag is mounted above the Glove compartment, within the Dashboard crash pad. NOTE : The Inflator is a component of the Air Bag Module, and is not a servicable item. The Air Bag module is serviced as a complete assembly ! When the Crash, and Safing sensor closes, power is supplied to the Inflator. The Ignitor chemical composition is Sodium azide/Copper Oxide, and when ignited, this is turned in to Nitrogen Gas, which inflates the Airbag. For this reason, it is not recommended that you eat, or attempt to eat the Ignitor ! These are not servicable items, and such must be replaced with the complete airbag assembly, if found defective. WARNING : Vehicle sensor direction and fitment is CRITICAL for the proper operation of the system ! If a Vehicle equipped with an Airbag system has been involved in an accident where the fenders, or front grille area have been damaged, inspect the sensor mounting brackets for deformation. If damaged, the sensor should then be replaced whether or not the airbag has been deployed. In addition, ensure that the body structure in the area of the sensor mounting is restored to its original condition. and Inside the Diagnostic monitor, (The Safing sensor). NOTE : At least 1 Crash sensor, and the Safing Sensor must be triggered, in order for the Airbag to inflate. The Airbag will NOT Deploy, unless the safing sensor has been deployed ! The safing sensor ensures that incase there is an electrical short circuit in one of the primary crash sensors or wiring, the airbag WILL NOT deploy when it is not required. In such a situation, the system depends on the safing sensor to prevent deployment until the thermal fuse opens. The Airbag diagnostic monitor continuosly monitors the air bag system, components, wiring, and connections, to determine possible faults within the system. If the Monitor detects a possible fault in the system when the ignition is switched on, a diagnostic trouble code will be recorded, and the AirBag warning Lamp will be Illuminated. The Airbag diagnostic Monitor does NOT deploy the Airbag in the event of a Crash. 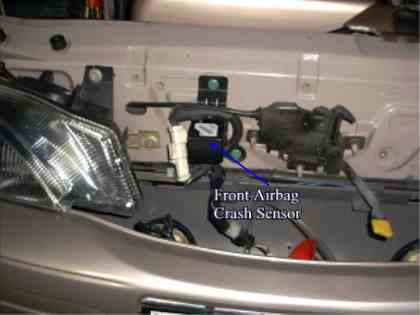 The Crash Sensors are Hard Wired to the Airbag(s), therefore the Crash sensor(s), and Safing Sensor determine when the Airbags are to be deployed. Features and Functions of the Airbag Diagnostic Monitor. The Airbag Diagnostic Monitor illuminates the Airbag Indicator within the instrument cluster, when the Ignition is switched "On" for a period of 8 seconds. Fault Codes may not be displayed for up to 45 seconds after the Ignition has been switched on. This is the amount of time that the DIagnostic Monitor requires to complete an Airbag system Test. Fault Codes are displayed as a series of flashes on the Instrument Clusters Airbag Lamp. If an Airbag fault fault is present and the Airbag indicator is malfunctioning, then an audible tone will be heard. The tone is a series of 5 (Five) sets of 5 (Five) Beeps. If the tone is heard, the Airbag Warning Lamp is Inoperative, and a system fualt that requires attention, is present. If a fault exists that makes unwanted Airbag deployment possible, the Airbag diagnostic monitor has an internal thermal fuse that will blow (Open Circuit) automatically. This removes all power to the airbag deployment circuit. The Airbag Indicator will flash, or continously stay Illuminated, as a sign that the Airbag System nneds to be serviced. CAUTION : The thermal fuse does not blow (Open Circuit) becuase of excessive current flow. DO NOT ATTEMPT to short circuit the thermal fuse with a circuit breaker, or any other type of fuse. The Airbag Diagnostic monitor includes an internal battery backup power supply. This feature ensures that the Airbag system has sufficient power to deploy the Airbag in the event that the Battery, or Battery cables are damaged in a colision before the crash, and safing sensors close. The backup power supply will deplete its stored energy, approximately one minute after the positive Battery power cable is dis-connected. The Airbag Indicator will Illuminate continously for approximately 8 seconds, whenever the Ignition switch is turned On, and the Airbag system is working properly. If an Airbag system fault is present, the Airbag Illumination will either fail to Illuminate, Be continously Illuminated, or will Flash. The tone generator is internal to the diagnostic monitor. The Airbag indicator lamp is the prime indicator for determining the Airbag system readiness. However, a series of 5 (five) sets of 5 (five) tones will be heard if the airbag indicator lamp is in-operative and a fault occurs in the system. These tones indicate that the Airbag system requires servicing, in order to function correctly in the event of a collision. The Airbag sliding contact (Clockspring) assembly is mounted on the steering column, behind the Steering wheel. (On the steering Wheel Boss). The sliding contact assembly transfers electrical signals from the steering column, to the steering wheel contacts, for the Airbag system, the Horn, and the Cruise Control system. Airbags can be handled quite safely, as long as a few basic precautions are taken. Always wear eye protection when removing, fitting, or carrying Airbags. When carrying Airbags, always carry them with the trim cover facing away from you. When placing an Airbag on a flat serface, or bench, always place it with the trim facing away from the surface. Wait 30 minutes for the discharged unit to cool before handling. Wear eye protection and gloves when handling deployed Airbags. If an operator inhales the gases of an Airbag deployment, then quickly move the operator away from the Vehilce, and Flush the eyes with Water. If the skin is irritated, wash the exposed skin with soap and water. The powder is slightly Alkaline, but is not considered Toxic. Anyway, when disposing an undeployed Airbag or a Vehicle with an undeployed Airbag, the Airbag should be deployed using the following proceedure. WARNING : Remote deployment is to be performed outdoors with all personnel at least 20 feet away to ensure personal safety, and Due to the loud BANG that occures when the Airbag is deployed. Cut the two module wires and strip 25mm of insulation from the wire. Obtain 2 Wires, that are at least 10m long, and connect to the Airbag Wires. Place the Airbag, with the Trim cover facing upwards, on a flat surface, in a large deserted area such as a carpark. Staying at least 10m away from the airbag, deploy it by touching the ends of the Wires to a 12V Battery. Allow at least 10 Minutes Before approaching the Airbag to allow for cooling. You can now safely throw the airbag away, as there is no more fun to be had from it ! Warning : The Airbag MUST be deactivated as described below, prior to commencement of any work that is to be carried out on the system ! This includes work on sensors, wiring, steering column, and other components. Do not attempt to service the sensors, clockspring, module, battery backup, or the Airbag. These items should be replaced with new components if found faulty. Remove the Screw Concealing Plugs, and remove the 2 screws located on the sides of the Steering wheel Boss, near the Wheel mounted cruise control Buttons. Place the Airbag, Face up, in a safe place. Connect the Airbag to the Clockspring connectors. Position the Airbag on the Steering Wheel, and install the 2 (two) retaining screws. Torque the screws to 10Nm. Connect the Battery Gorund Cable. Verify that the Airbag Lamp does not indicate a System fault. The diagnostic monitor illuminates the Airbag indicator for approximately 8 seconds when the ignition switch is turned "On". This indicates that the Airbag indicator is operation. If the airbag indicator does not Illuminate at all, or stays continously on, or flashes, then a fault has been detected by the diagnostic monitor. Fault codes may not be displayed for up to 30 seconds after the Ignition switch has been turned On. This is the amount of time it takes the diagnostic monitor to perform all tests, and to verify the system faults, if present. Fault codes are displayed as a series of flashes and pasues of the Airbag Indicator. Fault codes are prioritised numerically so that if more than 2 (two) or more fault codes exist, at the same time, the fault code with the highest priority will be displayed. The Diagnostic Monitor incorporates Non-Volatile Memory (NBM) to store the fault codes and retain them indefinitely. The Diagnostic monitor will always flash the highest priority fault code stored in the Non-Volitile Memory. Fault codes may be cleared from the diagnostic monitor after the fault conditions have been fixed. The Diagnostic monitor distinguishes between hard and intermittant (or repaired) fault conditions. Fault code numbers 12-45 represent a hard fault (ie a fault that is still present). Hard faults are higher priority than intermittant fault codes, and cannot be cleared from the Non Volitile Memory. Only Intermittant fault codes (Numbers 52-85) may be cleared from the Diagnostic Monitor. If a system fault exists and the Airbag Indicator is not functioning, an Audible tone will be heard, indicating a need for service. The tone is a series of 5 (five) sets of 5 (five) beeps. This does not indicate a Fault Code of 55, or any other code. The Airbag indicator MUST Be serviced, before the Fault Codes can be determined. If a Fault Exists that makes unwanted Airbag Deployment Possible, the Airbag diagnostic monitor will attempt to remove deployment power by turning on a solid state switch to blow a 10 Amp Airbag Fuse. WARNING : Under no circumstances substitute another fuse value for the 10 Amp Airbag Fuse ! Any other fuse other than a 10Amp fuse will cause a disarming failure, and may result in danger to the occupants of the vehicle. Do not attempt to replace the 10Amp fuse until the Airbag System has first been de-activated. If the 10 Amp fuse has been blown by the Diagnostic Monitor, the Diagnostic monitor will attempt to blow the fuse again, untill the proper fault has been fixed, and the Fault memory has been cleared. Use the Following Diagnostic Proceedure to obtain an Airbag Fault Code, and then use Johnny to determine how to remidy the Fault. Johnny may specifiy certain Instructions that will need to be performed, The following is a list of these Special Instructions, and What will need to be performed. This means that the connector should be inspected for proper seating to its respective mating connector. Also the terminals should be inspected for good, clean contacts, and the wiring should be correctly crimped to the terminal. Johnny may specify that the Diagnostic Connector, or Crash Sensor may need to be disconnected. This Does not mean that the Object is to be removed. Also, a Disconnected Part is not to be Reconnected, until instructed by Johnny. Johnny may specify that the Airbag System is to be De-Activated. The Following Instructions will allow you to acheive this proceedure. 1) Disconnect the Battery Ground Cable, and Wait 1 (one) Minute for the Back up Power to be Dissapated. 2) Remove the 2 Screw Concealing Plugs, mounted on the side of the Sterring Wheel Boss 9Near the Cruise Buttons), and Remove the 2 Screws used to secure the Airbag. 3) Disconnect the connections form the clockspring to the Airbag. 4) Attach an Airbag Simulator to the Airbag Connectors on the Clockspring. 5) Place the Airbag Face up, in a safe place. 6) Reconnect the Battery Ground Cable. Johnny may specify that the Airbag System is to be Re-Activated. 3) Connect the clockspring to the Airbag. 4) Position the Airbag on the steering Wheel Boss, and instal the 2 Retaining Screws. This simply means that the Ignition switch should be switched On, and the Airbag Error Lamp should be observed. If the Airbag Lamp stays on for six seconds, and then stays out, the system is then fuctioning properly and all faults have been serviced. You should watch the Lamp for at least 30 seconds, as some errors are not diagnosed immediately after the Ignition is switched On. Diagnostic Codes are displayed through different flashig sequences of the Airbag indicator Lamp, on the Instrument Cluster. Only one Code, with the Highest Priority will be displayed, even if multiple fault codes exist. To Retrieve successive codes, rectify the current Fault, and Clear the Other Codes using the Code Clearing Proceedure. Codes will be displayed once they are detected by the Diagnostic Monitor. Codes may not be displayed for up to 30 Seconds after the Ignition is swtiched On. Any stored codes will not be visable until the following proceedure is conducted. 2) Turn the Ignition ON, and observe the 6 second AirBag indicator Prove out. 3) Immediately after the Airbag Lamp has turned Off, Remove the Short on the Airbag Clear Line. 4) The Stored Codes will then be Displayed. 2) Allow the Code to be Displayed. 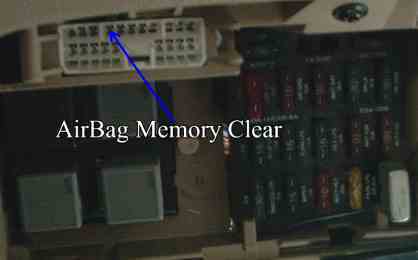 3) Apply a Short Circuit to the Airbag Memory Clear Pin of the Diagnostic Connector to Ground (See above Picture for further details). 4) The Code will be cleared after 5 Beeps have sounded. Repeat the Above untill all the required codes have been Cleared. Document written by: Matti on 06 2002>, Copyright © 2005 Matti, all rights reserved.